A Vogel Bronchoforce is a traditional herbal medicinal product used for the relief of chesty coughs, mucus coughs and catarrh, exclusively based on long-standing use as a traditional remedy. Thyme has been used through the ages by many different cultures. The Egyptians used it for embalming, the ancient Greeks put it in their baths and used it as incense in their temples, and in the Middle Ages the Europeans believed that by putting it under their pillows they would have a sounder, nightmare free sleep. Of course nowadays it is used in cooking all round the world and is also used as a herbal remedy for a number of conditions. Contains the tinctures of: fresh Hedera helix (Ivy) herb 40%, fresh Thymus vulgaris* (Thyme) herb 35%, Glycyrrhiza glabra (Liquorice) dried root 24.875%, Aniseed essential Oil 0.075%, Eucalyptus Essential Oil 0.05%. Extracted in alcohol: 48% v/v. 20 drops in a little water, 3 to 5 times daily. Do not use during pregnancy or if breastfeeding. 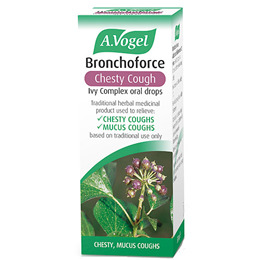 Below are reviews of A Vogel Bronchoforce - Chesty Cough - Tincture - 50ml by bodykind customers. If you have tried this product we'd love to hear what you think so please leave a review. Brilliant for treating my chronic bronchitis. Makes my chest easier to get rid of mucus. My husband suffers from chronic obstructive pulmonary disease (COPD)and has always got a cough all year round. At certain times it becomes more acute and he ends up having to take antibiotics and steroids. 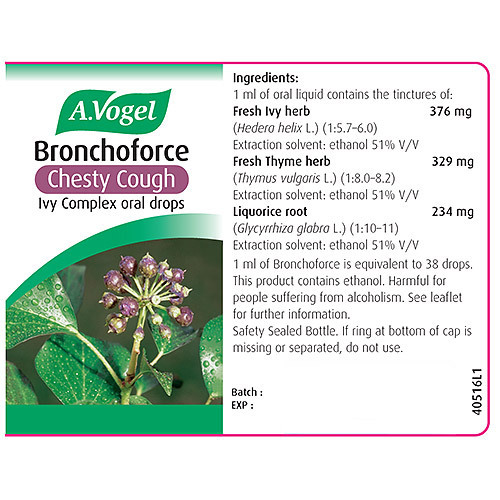 He now takes Bronchoforce tincture daily and it loosens the mucus and gets it moving.It just seems to keep things at bay.However,when he feels his condition worsening,he will step up the dose,and it most definately helps. Glad we have come across this little gem.